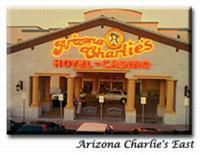 Arizona Charlie’s Boulder is located five miles from the Strip in Las Vegas, Nev. The hotel is two-and-one-half miles from Las Vegas National Golf Club and three miles from Desert Wetland Park. 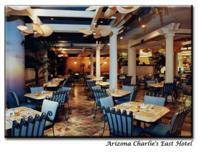 Arizona Charlie’s Boulder contains four restaurants, including Yukon Grille featuring rotisserie duck with orange-cherry sauce, stuffed pork chops and Oysters Rockefeller. The 24-hour Sourdough Cafe offers traditional American specials. Wild West Buffet serves breakfast, lunch, dinner, Sunday champagne brunch buffets, and mid-week crab legs and prime rib. The hotel contains meeting rooms for small groups. The hotel’s 75,000-square-foot casino offers blackjack, slots, video poker, craps, roulette, pai gow, a 24-hour bingo parlor, and a race and sports book. The Palace Grand Lounge provides live entertainment weekly. Arizona Charlie’s Boulder features a seasonal, unheated pool and a heated eight-person spa tub. The adjacent RV park offers complimentary access to the heated pool. Guestrooms at Arizona Charlie’s Boulder are contained within eight three-story buildings featuring terra cotta accents and roof tiles. Rooms contain caramel-colored furniture and textured gold-colored wallpaper. Rooms include dial-up Internet access and televisions. Coffeemakers are available upon request.